If you’re someone who has tons of time, energy and space to spend in the kitchen cooking elaborate meals (and you love doing things that way), I congratulate you. This post is probably not for you unless you’re just curious about how things are at the opposite end of the spectrum. I love to cook, but I live in a small space with a tiny kitchen. I have about 15 inches of uninterrupted countertop space for all my cooking prep. So here’s what’s in my minimalist kitchen, and how I use it to make cooking as easy as possible. Note: As an Amazon Associate I earn from qualifying purchases. Affiliate marketing income does not cost you a penny, and helps keep this blog running with lots of free articles about minimalism! Please see my Disclosure for more details. We, of course, have all the basics for eating: flatware, cups, bowls, and plates. We just don’t have that many of them. When mom moved in, we considered getting more, but after a few weeks, I determined that wasn’t necessary. Our RV doesn’t have a dishwasher, and the sink is a small double sink. One side is for dirty dishes, and the other sink holds our dish drainer. I found that I have to wash dishes two to three times per day because the tub is always full. So more stuff would not help, because there would be no place to put more dirty items without taking up valuable counter space. We also have one pan, one pot, one baking dish, and one baking sheet. And of course, the usual cooking utensils, like a spatula, spoon, ladle, and whisk. None of our stuff is fancy. When you're in an RV, things will occasionally break in transit, so nothing is safe. I like what we have, but I’m not going to cry if it gets damaged. 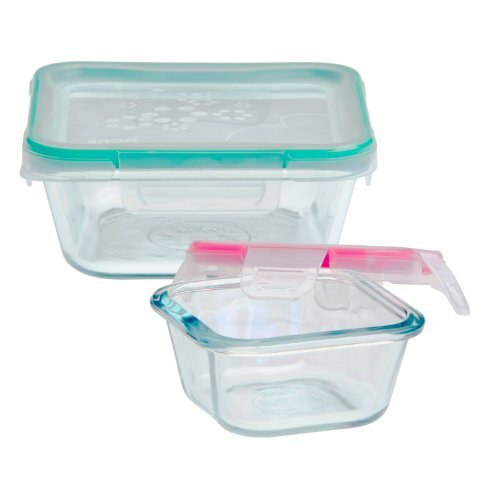 For storage, we have a few plastic containers that are for cold food and tempered glass with locking lids for heating food up (Amazon affiliate link). I only buy glass containers that are oven- and microwave-safe. They have more than one purpose since I can bake with them, which eliminates the need for several different sizes of baking dishes. The locking lids mean that if things get jumbled in the fridge during transit, they won’t spill all over the place. 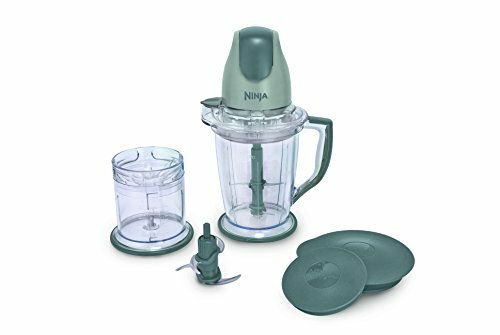 I have a small, high-powered blender (link to Amazon) that works great. I love that the blades are removable for easy cleaning. It's strong enough for both smoothies with frozen fruit/veggies and chopping up nuts into a paste when I make nut-based "cheeses." Having a good blender means I don't have to get a separate food processor. I love pasta dishes, but pasta made from flour of some kind is processed, so I eat it sparingly. 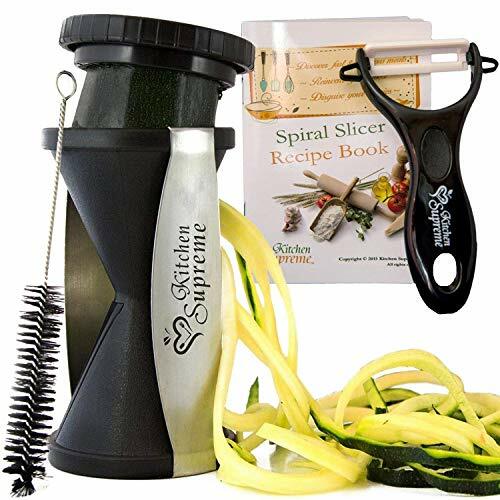 I'll make pasta from veggies instead with my spiralizer (affiliate link) for spaghetti and noodler for lasagne-style noodles. They're not difficult tools to use, and veggie noodles cook faster than processed noodles. So I can have pasta sooner and healthier! 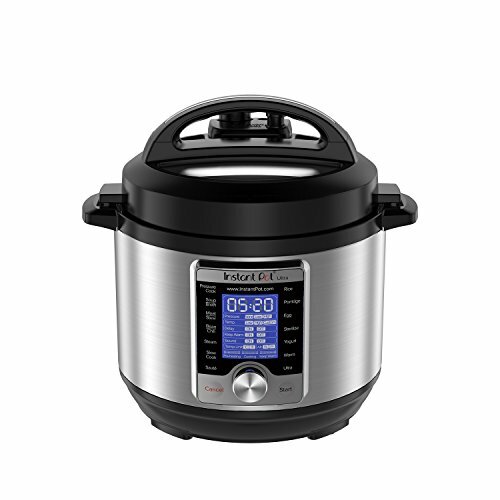 My kitchen would not be complete without an Instant Pot (affiliate link). We have the smallest size because it needed to fit in our tiny RV cabinets (and also run off our solar setup). We use it every couple of days to make rice, homemade beans, and steam veggies. It's also great for potatoes, corn on the cob, and curry. Since we prefer to follow the weather, we're usually in temperate climates. That's great, except for when we use the oven, which quickly heats up our small space. We don't want to have to run the air conditioner every time we bake. So now that we're plugged in, we decided to invest in an air fryer (Amazon link). 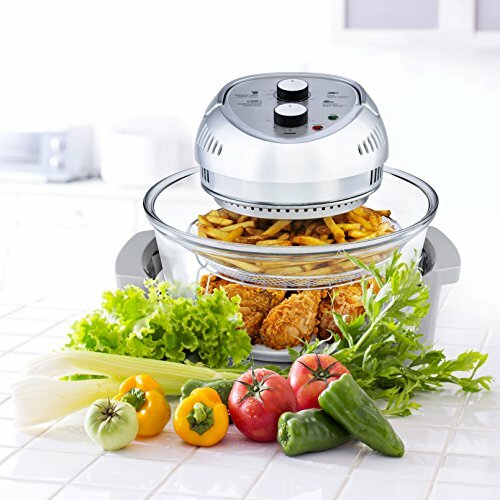 It uses halogen lamps to cook the food, so it gives off less heat than an oven, while still preparing food efficiently. It seems to take about the same amount of time as it would in the oven for food like fries and tofu, but it's faster for roasting veggies from frozen. You also have to turn the food several times, because the heat source is only coming from one place, and doesn't get distributed as well as it does in an insulated oven. But you can definitely get that nice, crispy texture from baking or frying without all the added oil and unnecessary fat. When we do use the oven, we have a copper baking dish that works great. It's non-stick, so no added oil needed there either. 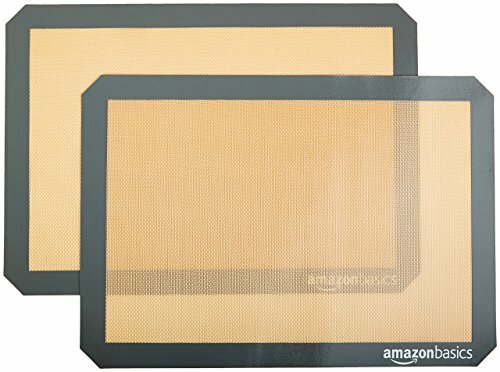 We use a baking mat (Amazon link) over the flat sheet every time. It saves money (and the environment) by eliminating tin foil, and our waistlines because it doesn't need to be greased before use. We use so little oil that we bought one small bottle (I think 12 ounces) of extra-virgin olive oil as our only oil. It lasted us nearly two years. About a year ago, I decided I wasn't going to keep certain things on hand. I used to make very complicated dishes, so I had all kinds of flours and exotic ingredients. I used them up and didn't buy more. These days I choose to flavor food with spices instead of trying to perform every complicated recipe I see. Even though we have a drawer full of spices, they take up relatively little space in the scheme of things, because of how little else we store. Thanks to the Instant Pot, we don't have a lot of canned items, either. We buy a big (25-pound) bag of rice and 10-pound bags of potatoes. Those are our bulkiest pantry items. But they are the base of most of our meals, so we go through them quickly. It wouldn't make sense financially to buy smaller amounts. Luckily our kitchen has room for them. Frozen veggies are bought instead of fresh when something will only be used a little at a time. We're also a fan of frozen bags of mixed vegetables. They're cost-effective and safe time with washing and chopping. We buy one at a time with refrigerated items. Just because there's a two-for-one sale on almond milk doesn't mean we're buying two. There just isn't enough room. Fresh veggies are washed and chopped up right away to save space. Fruits that can be stored at room temperature are on a basket on our table. We go shopping more often and don't buy more than can be eaten in a few days, or a week at most. Shopping lists are based on specific meals that will be cooked that week. Steering clear of impulse buys is key to making sure everything fits. That tiny strip of countertop leaves a lot to be desired when it comes to food prep. If I put one appliance on the counter, half of my space is gone. There is absolutely no way that more than one person can make food in our kitchen at the same time. Fortunately, either one person cooks for everybody, or we stagger our meals. Mom gets up the earliest, then me, with Ryan preferring to eat the latest. So it isn't usually a problem. Advance preparation is helpful. For example, I make a large batch of rice or beans in the Instant Pot, so that appliance isn't taking up space on my countertop when I'm making a meal. I also focus on one thing at a time. I take out one kind of veggie from the fridge, do what I need to do with it, then put it away before bringing out the next item. If I run out of space, I move some things over to the dining table. We're thinking of getting a rolling island--not because we need the storage, but so we have more counter space. A counter-height table with a durable surface would be fine too. We're just waiting until Ryan's shoulder is healed so he can help me lift it. Cleaning our tiny kitchen is very easy. There's so little to clean, it only takes a few minutes. The longest part is washing the dishes by hand, but even that is quick. Look at items on your top shelves or in the backs of the cabinets that are collecting dust. When was the last time you used them? Can you use something else you already have to prepare or cook the same foods? If a dish breaks, do you immediately go out to get a replacement dish? Or even worse--do you buy a whole new set? I recommend having only one set of utensils and plates per person in your household. So four people = four plates. That doesn't mean you have to get rid of what you already have. But just don't replace it when it breaks. 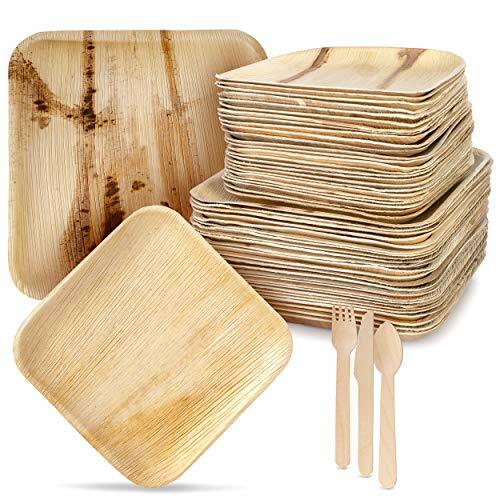 If you have a big party and don't want to use paper plates, there are very nice-looking bamboo or palm leaf disposable plates, bowls, utensils, and serving trays (affiliate link). Stop buying and throwing away food because you can't find it to eat it. Do meal planning before you go shopping, and stick to your list. Keep an eye on foods that spoil quickly and cook or freeze them to extend their lives before you have to throw them away. Don't buy new appliances or fancy ingredients, thinking you'll start cooking more often if your history tells you that you won't. It's ok not to be a gourmet chef. Just stick to what you can realistically accomplish, and find ways to do it well and make it tasty.